Orange County Pit Bull Rescue gets all of its dogs from area shelters; currently, we are full. Orange County Pit Bull Rescue’s mission is to promote responsible pit bull ownership and keep pets in their homes. Because each dog we take in can take up to a year to place and can cost up to $1000 to treat, we have to limit the numbers we hold in our foster homes. We get numerous requests to take in dogs each day; we have to limit ourselves to those dogs at shelter that are at risk of euthanasia, and only those we have space for. We are not able to respond to emergencies from the public. Lou found a great home through our Courtesy Listings program! 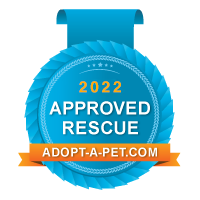 Since we aren’t able to rescue every dog in need, our Courtesy Listing program allows us to assist our community in finding responsible homes for dogs. We hope that by keeping these dogs in a safe home until they can be adopted will reduce the numbers of dogs turned into shelters and at risk for euthanasia. How do we help find a home for your dog? A profile of the dog is listed on our website; Facebook page; Adopt-a-pet.com and Petfinder pages. We provide you with tips on effectively promoting your dog; screening potential applicants and completing an adoption. Get a head start by filling out our questionnaire here, so that we may gain information on the dog you wish to place.